Honoring Quaker women of the past to empower those in the present and the future. She was obedient to God’s call on her life no matter where it landed her (Lancaster Castle – a deplorable prison). She balanced motherhood and ministry (often by including her children in her travels). Her beliefs were based on Biblical truths and she defended her beliefs (and the teachings of Friends) using Scripture as the foundation. She wore color and mentions receiving scarlet cloth as a gift from her late husband George Fox (1700). Now, this may seem out of place, so I will explain. Many of you associate Quakers and the color grey. This association came in 1698, after Fox’s death. Quakers were creating rules and not wearing coloring was one of these rules. Margaret wrote different epistles (letters) to Friends warning them of this. In 1698 she wrote them and her last letter was written to address this same issue in 1700. She said, “these silly outside imaginary practices are coming up, and practiced with great zeal, which has often grieved my heart.” There was a change in Friends thinking from simplicity and wearing items made by free people (versus slave labor) to drab, generations old, clothing being godly dress and Margaret called them out on it. Her words were unfortunately not heeded and “Quaker dress” continued for decades. She was an influential minister and is remembered for the work God did through her and not because of her social standing or association because of whom she married. 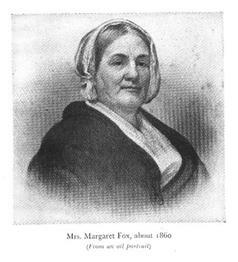 Margaret is considered the Mother of Quakerism, not because she married George Fox, the founder of Friends, but because of who she was. So yes, the Father of Quakerism, George Fox, and the Mother of Quakerism, Margaret Fell married, but they were both established in their roles as leaders years before they married. In the history of Friends, there are many women who obeyed God’s calling and preached His word, regardless of society and cultural acceptance. In this Quaker Women Series, my goal is to introduce many lesser known women to you; however, the well known women are well known for a reason and some of them will be featured here, as well. This article is contributed by Joy Lujan, pastor at Whitney Friends Church and alumna of Barclay Graduate Studies. To read about more Quaker women of history, take a look at Joy’s blog using this link.